What’s life without a little bit of conflict here and there? 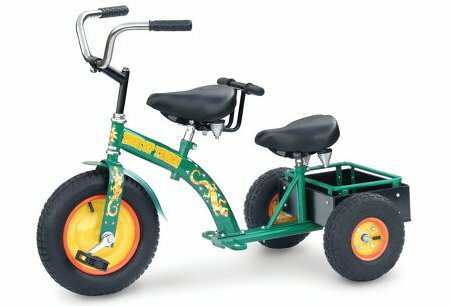 The $299.99 Sibling Tricycle that you see above might cause a dent in your monthly budget, but at least it kills two birds with one stone, but I might dig up another feathered friend to the collection if I manage to find more points to support the purchase of this particular trike. For one, you need to buy only one tricycle instead of two, so that means a lower cost of maintenance in the long run. Even better if you gave birth to twins, don’t you think so? Number two, you get to keep an eye on two of your kids simultaneously since they’d be on the same trike, instead of having one about to fall down from the tallest branch of the tree in the garden, while the other is about to make a dive into the shallow part of the pool. Surely managing two little kids on a single trike is far less heart-stopping, and easier of course. Ah, the third ‘bird’ so to speak with a single stone – you need not purchase a larger bicycle for some time to come, since both sides are wide enough for stability, spring-cushioned for additional comfort and can be adjusted for growth spurts. There is even a wooden cargo box located behind the rear rider’s seat to stash away some toys or other items (but certainly not a third sibling!). Make sure you have a penchant for assembling stuff, otherwise this might lower opinions of you in the next parents’ poll by the kids.